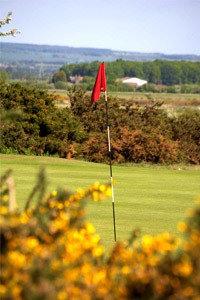 Golfing at Ganton is a delight at any time of the year - and Gary Brown, our PGA Qualified Professional, and his staff look forward to providing you with a warm welcome and a first class service. Gary joined Ganton in 1982 as the Assistant Professional and took over as Professional in December 1988. He was Captain of the North Region PGA in 2001 and is recognised as one of the best Club Professional golfers in the North of England. Gary played in two Opens Championships (1996 at Royal Lytham and St. Annes and 1998 at Royal Birkdale) and won the Lombard Trophy, Europe's largest Pro Am, in 2004, with Ganton member Michael Adamson. Ollie Adamson is Assistant Professional. Ollie has only recently joined Gary in the Professional's Shop and is nearing the completion of his first year PGA Qualification.